SkyStar's two-place Classic IV will be available as an experimental amateur-built (51-percent kit) or as a two-place ultralight trainer, as long as the training exemptions remain in effect. The panel of the Classic IV provides room for a wide variety of instrumentation. Sideby- side seating and dual controls make it valuable as a two-place ultralight trainer as well, as long as the training exemptions are in force. SkyStar Aircraft Corp. will continue to offer the singleplace Kitfox Lite as a Part 103-legal ultralight (254 pounds or less) or as an experimental amateur-built kit. Depending on its certification category, the Kitfox Series 7 can be outfitted with engines ranging from the Rotax 914 Turbo, shown here, to Continental or Lycoming engines. The ready-to-fly LSA model will only be offered with the 100 hp Rotax 912S powerplant. The Series 7 cockpit offers plusher refinements, while still offering plenty of panel room for instrumentation. Ed Downs and Frank Miller look forward to leading SkyStar Aircraft Corp.'s two new divisions to a bright future. SkyStar reorganizes to offer ultralights, homebuilts and special LSAs under "one" roof. For the new SkyStar Aircraft Corp., the light at the end of the proverbial tunnel is not a locomotive; it's the coming of a bright new day in light aviation. As the publication of the final sport pilot and light-sport aircraft (SP/LSA) rule looms on the horizon, business is looking better for SkyStar and most other manufacturers and suppliers of light aviation equipment. The two-place SkyStar Series 7 will have multiple personalities. SkyStar Sport Planes will manufacture a variation of this model as a ready-to-fly special LSA. Depending on the parameters of the final rule, SkyStar Sport Planes may sell an experimental LSA kit (more than 51-percent complete). When flown as an LSA, the Series 7 will be limited to the Rotax 912S engine as its powerplant. SkyStar Aircraft will continue to offer the Series 7 as a 51- percent amateur-built kit, with a variety of engine options, including the 914 Turbo version shown here. Sport pilots can fly amateur-built versions if the aircraft meets the definition of a sport pilot-eligible aircraft. 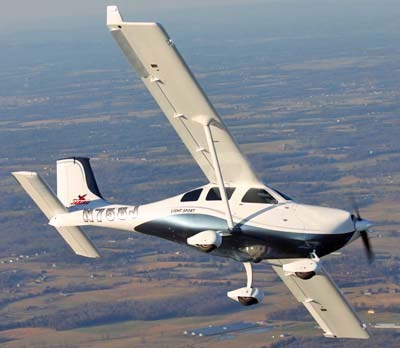 SkyStar Aircraft Corp. recently reorganized to take full advantage of the pending SP/LSA rule. This corporate tune up has resulted in two divisions. One division will continue to produce 51-percent amateur-built kits. Frank Miller, veteran SkyStar salesman and designer, is the new company CEO and head of the SkyStar Aircraft Corp., Experimental/ Manufacturing Division. It will produce Kitfox Lite, Classic IV, and Series 7 amateur-built (51-percent) kits as well as a Part 103-compliant version of the Classic IV (formerly known as the Lite Squared). The second division, SkyStar Sport Planes under the direction of Ed Downs, initially will manufacture the Kitfox Series 7 only as a special (readyto- fly) LSA. Later, it may offer the Series 7 as an experimental LSA kit (more than 51-percent complete), but the company is waiting for the final rule before making the decision. Ed is a logical choice to take over the Sport Plane division of SkyStar. He has a long and illustrious background with certificated aircraft, which will be put to good use in managing LSA production. He worked on aircraft certification for the Boeing 747 and the Lockheed L- 1011, so he's no stranger to the regulatory environment. Both men expect their shops to prosper as the two divisions develop all three models to their fullest potential. Tough Period Ends Ed is an energetic fellow who becomes animated when he speaks about the restructuring the company went through recently. He's also an honest guy, and he'll tell you the last few years have been tough financially for the company. Like many other companies, SkyStar was forced to slim down. Many pilots and buyers may not be aware of how difficult the past three years have been for airframe builders. When the SP/LSA rule is final, Ed and Frank believe the company could eventually see sales soar beyond 500 units a year. They report that SkyStar could ship 100 units or more in 2004 if the rule comes soon and if buyers get off the fence. Ed notes, "Eighty percent of potential buyers calling the factory say they will wait (to buy) until the new rule is issued." A Kit-Built Aircraft Sales Surge SkyStar Aircraft Division forecasts a boost to its kit business from the upcoming SP/LSA rule. All three SkyStar models-the Kitfox Lite, Classic IV, and Series 7-will meet the definition of an LSA, enabling them to be flown by sport pilots. Of course, the aircraft can be built as experimental amateur-built aircraft not compliant with the LSA category and then be flown by recreational pilot certificate holders or higher. Frank predicts a 50-percent increase in the sale of amateur-built kits over the next two years. He expects most of this increase will come from those fence-sitting pilots or those who believe maintaining a third-class medical may become difficult or expensive. The ability to build a 51-percent kit aircraft and fly it as a sport pilot with a driver's license medical will be a big plus. When you think about investing $40-$60,000 in an airplane, you want to know you can keep using it for some years. 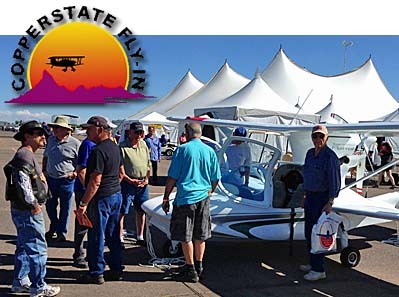 As holders of the repairman certificate for their aircraft, these 51-percent kit builders will be able to do all their own maintenance, whereas a buyer who purchases an experimental LSA kit or a special, ready-to-fly (RTF) LSA from SkyStar Sport Planes will only be able to do maintenance as approved, and trained, by the manufacturer. That may seem a subtle difference, but it becomes meaningful. For example, SkyStar Sport Planes may tell LSA buyers that if the airplane's Rotax engine needs service, they'll need to unbolt it and send it to a Rotax Service Center, whereas an amateur- built owner can do all the engine maintenance if he or she wishes. Frank adds, "We've found that kit builders are safer pilots. They know their systems inside and out after building the airplane, and they tend not to exceed limitations." A New Star Where the new SkyStar story starts to get intriguing is when growth predictions for the Series 7 special LSA are discussed. These ready-to-fly aircraft will cost more, so the dollar volume the company might generate has begun to attract venture capitalists. SkyStar Sport Planes sees its initial market as non-current pilots returning to aviation and ultralight enthusiasts becoming sport pilots to carry passengers. After that they'll seek newcomers to aviation. "That group may be the last we'll approach, but they foretell the future," says Ed. "That's where the SP/LSA rule can offer new growth to the aviation marketplace. These new student starts of tomorrow will be a key indicator of the health of recreational flying in the years ahead." Rather than being required to meet a Part 23-level certification standard to obtain type and production certificates, special and experimental LSA kits must meet FAA-mandated consensus standards. These standards are under development by various ASTM International committees. Ed's previous experience working in the type-certificated manufacturing world will be valuable in setting up a production line for fully assembled aircraft. He believes the ASTM standards are a unique approach that opens doors for safe, interesting, affordable, and manageable aircraft for lots of pilots to enjoy. The Sporty Series 7 Ed believes the traditional tube-andrag Series 7 will be a strong competitor to the composite LSA creations expected to arrive from Europe. Why? "Because it'll hold up to duty," he says. "The European flying culture doesn't ask the same of their airplanes as Americans do," he explains. "European aircraft are often flown and maintained by clubs, kept in hangars, and treated like expensive sports cars. Conversely, Americans want to stuff people and gear inside their planes and use them rigorously. They may be stored outside and flown like someone drives an offroad vehicle." He continues, "Tube-and-rag construction, besides still being the best for strength-to-weight ratio, is a reliable and rugged construction technique." By contrast a stressed skin, monocoque design can be made un-airworthy with skin damage, and that damage may not be easily identified. While composite planes have terrific ramp appeal, they may not hold up as well to rough-andready sport pilots. Reflecting on the era of tube-andrag Aeronca Champs and Piper Cubs, Ed observes that neither Aeronca or Piper ever produced a practical crosscountry airplane that came in around 1,200 pounds gross weight. (Note: 1,232 was the maximum gross weight listed in the SP/LSA notice of proposed rulemaking.) "They all got a little heavier when they tried to fly 400- 500 miles with two adults inside. The LSA category will break that barrier," he says. 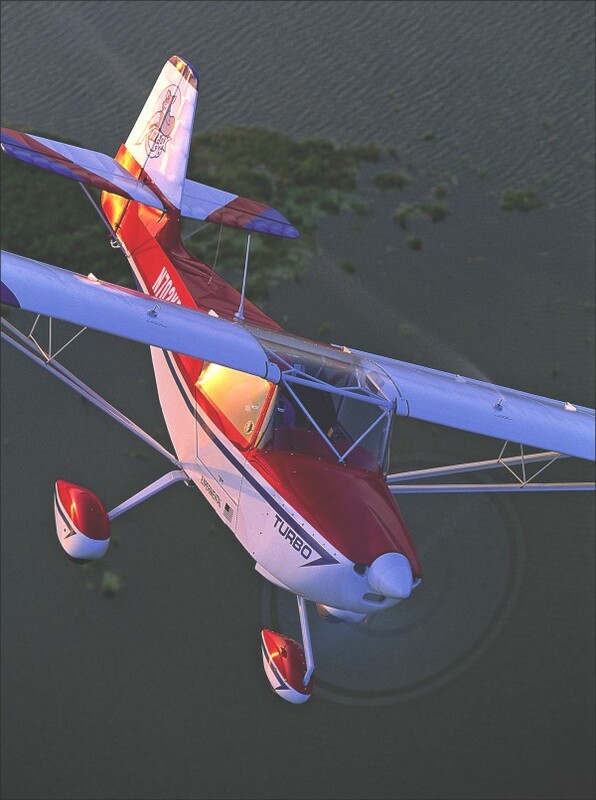 An average J-3 Cub has an empty weight of 750 pounds, whereas the Series 7 LSA, fitted with a 100-hp Rotax 912S engine, should have an empty weight of approximately 730 pounds, Ed figures. That will allow a reasonable useful load before the aircraft bumps against its maximum gross weight. If the final SP/LSA rule comes with an increased gross weight, as EAA and others recommended, the Series 7 will have an even greater useful load. However, when built in the experimental amateur-built category, the Series 7 can be fitted with heavier Continental or Lycoming engines or Subaru conversions. When that happens, these planes will get too heavy to be flown by sport pilots, with weights more than 900 pounds empty and 1,550 gross. Kitfox Familiarity in an LSA I last flew with Ed Downs in 2002 in an aircraft the company then called the Kitfox Sport. It was essentially a prototype of the Series 7. In general, its handling qualities seemed more refined than the earlier Kitfox models I've flown over the years. Those changes come from several alterations to the venerable design. For example, the tail of the new model has an airfoil-shaped vertical tail formed by the use of intercostals (ribs or formers) to make a thick, symmetrical vertical fin. This construction method has no structural function. It merely forms a surface that Ed says contributed to the improved flying qualities I noted. Intercostal support isn't proprietary to SkyStar's aircraft. Formed verticals have been widely used to improve yaw stability. The intercostal aggressively brings the tail back in line. Many FAR Part 23 type-certificated airplanes (Cessna, Piper, Beach) use airfoil-shaped vertical surfaces to accomplish the same effect provided by intercostals. This construction technique is an option on SkyStar Series 7 amateur-built kits and standard on the special LSA model. I definitely felt the aircraft was much easier to coordinate. Unlike earlier Kitfox designs, I was able-with helpful coaching from Ed not to use the rudder too heavily-to keep the ball centered after a few minutes of flight. New-style flaperons also contributed to the improved handling. They produce more lift and lower stall speeds with less deflection, and their airfoil shape reduces adverse yaw in cruise to near zero, Ed says. I also found that if you use the ailerons modestly they exhibit light handling. On the other hand, if you crank hard on the aileron, it will start to resist. Ed calls this "load ramping," a technique used on Part 23 type-certificated airplanes for years. It makes for ailerons that seem light but aren't twitchy. SkyStar is aiming at the general aviation market, so Ed wants the aircraft to operate like a typical GA aircraft. For that same reason, the standard Series 7 LSA will have a conventional tricycle gear, but LSA buyers may have the option to order their RTF aircraft as a tail dragger. Builders of 51-percent Series 7 aircraft will have the choice of either a tricycle or taildragger gear configuration, and they can change the gear at a later date. The Series 7 LSA will have mechanical trim instead of electric trim. This isn't a step down. The manual trim is easy to set, whereas I found the electric one was a bit difficult to position precisely. SkyStar will use a spring interface to dampen pitch changes when the flaps are extended. The Series 7 LSA will have a 27-gallon fuel tank, but it will have a tab inside to help operators load only 18 gallons if they want a higher payload. Even at the lesser quantity of fuel, the Series 7 with the 912S engine will easily deliver at least a three-hour endurance with reserve, Ed says. SkyStar will promote a 600-mile range. Of course, the famous Kitfox foldingwing mechanism remains on the amateur built version of the Series 7 but may be dropped on the certified LSA version. It will take a close reading of the final rule to make that decision. Let's Get Ready to Fly Entry into the tricycle-gear Series 7 is a rear-end-first proposition. Lift the door, turn around, sit down, pull the joystick aft, and work your legs toward the rudder pedals. The Series 7's door latch mechanism works well with a fore-and-aft pin operated through a solid-feeling lever system. After our first landing in Florida's April heat, I popped the door latch, and the door neatly floated up, hovering at the bottom of the wing. Ed encouraged this by saying, "Start the air conditioning." Taxiing proved effective thanks to the tricycle-geared aircraft's differential braking. The Sport/Series 7 model I flew with Ed was powered with a Rotax 914 Turbo, so the takeoff roll was quite short. Even with the 100-hp 912S, the Series 7 will leave the runway quickly and with great enthusiasm, Ed says. My initial climb was done at 75 mph. For best angle of climb Ed suggests 65 mph, and for best rate hold 72 mph. Normal climbs are done at 85-90 mph. At first we approached for landing at 70 mph, though you can slow it down with practice. Every touchdown in the aircraft worked out well with no challenges. I'm one of many who enjoys a taildragger, but a nosewheel-equipped airplane is certainly easier on landings. My 720-degree steep turns done at a 45-degree bank went well. I did not have to add extra power, and my turns came out on heading almost perfectly. Unlike my memory of the earliest Kitfox models, the Sport/Series 7 had surprisingly low adverse yaw. Ed assures me that good quality would remain on the production Series 7 aircraft. Early Kitfoxes demanded a good bit of coordination between the rudder and aileron. Despite the handling improvements, this aircraft remained light to control. When I first tried coordination rolls, I had the ball rolling around liberally because I was using too much rudder. Ed explains patiently that this model calls for much less rudder. In fact you can just about do the coordination exercise with joystick alone. Stalls were clearly marked by stick shaking even when the stick was pulled full aft. The deck angle was extremely steep, and with the aircraft's liberal warning, you'd have to be asleep to overlook the onset of stall. The resulting stall breaks were also mild. While seated in the left seat, I noted that the skylight will provide good visibility when banking to the right, but to my own side lateral visibility was hampered as my head was above the bottom of the wing. You might want to ask your companion to assist in turns to your side. Are You Ready to Buy? SkyStar expects experimental amateur- built kit builders to get in the air in a Rotax 912S-powered Series 7 for less than $40,000. I stress this is what SkyStar projects a flyable aircraft will cost, including engine, engine mount, paint, interior, and several desirable accessories. Don't compare this price directly to airframe-only kits. With the quick-build options available from SkyStar, the price rises slightly to about $44,000. Fortunately, though, buyers won't have to pay all at once. The basic firewall- back airframe kit is $16,000. The rest of the aircraft can be purchased incrementally. For those who don't want to or don't have time to build, SkyStar forecasts a ready-to-fly Series 7 will be available in the $60-65,000 range, with the Rotax 912S as the standard powerplant. On the very light end, SkyStar will continue to offer the Kitfox Lite as a Part 103-legal ultralight, though Frank says the company is actively looking for a replacement for the 35- hp 2si two-stroke engine, no longer available, that helped keep the machine's weight under the required 254 pounds. SkyStar will also continue to provide the Lite as an experimental amateur-built kit, too, with the venerable Rotax 503 as the powerplant of choice. Those kits are priced at $11,745 firewall back with all quick-build features standard. Engine and instrumentation options and costs will vary depending on whether you're building the machine as an ultralight or an amateur-built aircraft. SkyStar Aircraft is actively positioning its company to remain a brand to watch in the years ahead. An inevitable shaking out is likely to occur in this industry as some manufacturers realize the task of producing ready-to-fly aircraft is greater than building kits. However, there'll be a diverse market for manufacturers to address. Those who invest in a SkyStar aircraft are making a long-term bet that should pay off handsomely. Notes: 1 Gross weight will be dependent on the final SP/LSA rule; the Series 7 was designed for 1,550 pounds gross. If the allowed LSA weight is greater than 1,232 pounds, as originally proposed, the useful load will rise along with the payload. 2 The kit-built Series 7 can weigh 1,550 pounds when these limits apply. SkyStar reorganizes to offer ultralights, homebuilts and special LSAs under “one” roof. For the new SkyStar Aircraft Corp., the light at the end of the proverbial tunnel is not a locomotive; it’s the coming of a bright new day in light aviation. As the publication of the final sport pilot and light-sport aircraft (SP/LSA) rule looms on the horizon, business is looking better for SkyStar and most other manufacturers and suppliers of light aviation equipment. The two-place SkyStar Series 7 will have multiple personalities. SkyStar Sport Planes will manufacture a variation of this model as a ready-to-fly special LSA. Depending on the parameters of the final rule, SkyStar Sport Planes may sell an experimental LSA kit (more than 51-percent complete). When flown as an LSA, the Series 7 will be limited to the Rotax 912S engine as its powerplant. SkyStar Aircraft will continue to offer the Series 7 as a 51- percent amateur-built kit, with a variety of engine options, including the 914 Turbo version shown here.